Husband, father, former college football player, coach and educator, sales professional, former senior executive, and author. Bud Boughton has lived an amazing life filled with a variety of experiences and yet, he sees himself as just an ‘ordinary guy’ who has been blessed to have many great people around him. A husband and father, he has lived a real life sprinkled with both successes and failures, all of which has taught him how to be resilient when facing the toughest circumstances. A native of Kenmore, New York (suburb of Buffalo), Bud grew up with wonderful, supportive parents in a very athletic family of three boys. All three boys were active in youth sports and would eventually all play college football. In fact, Bud began his professional life as a college football coach and educator, obtaining his Master’s degree while coaching college football at Ball State University in Muncie, IN. With his roots in education and coaching, he has always looked for new learning opportunities and has long been a student of both leadership development and performance improvement. Thus, it was no surprise when he moved almost seamlessly from the coaching profession into the business world where he sold for several Fortune 500 companies early in his business career (Proctor & Gamble, Xerox and IBM). He later left IBM to pursue opportunities in the banking software business where he held several senior level management positions and was an office of a publicly traded software company. As an author, Bud has written three books and numerous articles. His comments and opinions have appeared on the pages of FORTUNE magazine, INC. magazine, Sales and Marketing Management and in ETHIX Magazine published by the Institute for Business, Technology & Ethics. 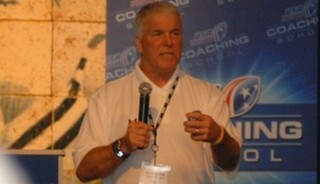 His latest book, Coaching is Teaching at its Best! has already been described in one review as a book that has the potential to change the course of youth sports in America. As a professional speaker, Bud’s credentials include everything from keynote addresses for state and national professional associations to guest lectures on college campuses and motivational presentations for national sales organizations. He’s even done storytelling sessions for elementary school audiences. Bud still maintains an active lifestyle playing hockey, golf and hitting the gym 2-3 times a week. He is a certified official with both USA Hockey and US Lacrosse and he has run nine full marathons over a span of some 35 years (including both the New York City Marathon and the Boston Marathon). In 1996, he successfully climbed Mt. Rainer (14,411 ft.), often considered one of the most arduous and difficult climbs in the lower 48 states. Highly creative and entertaining, most people who have the opportunity to work with him come away with the same impression…he is real and has an enduring passion for life. In a second marriage with his elementary school sweetheart, Cindy, they currently reside in a suburb of Indianapolis sharing the lives of their combined family (six sons and nine grandchildren).